I love whenever someone takes old classic stories/fables/etc. and gives them a weird twist. For example, I am a huge fan of the incredible anthology of tales, "The Stinky Cheese Man and Other Fairly Stupid Tales," as well as any yarns that provide a view of a story from another character's viewpoint (like the villain) or which, "Continue," an old tale, as it were. 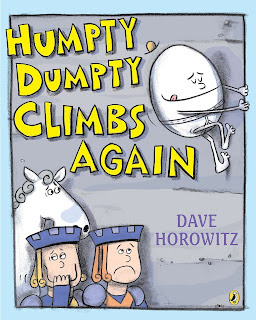 "Humpty Dumpty Climbs Again," by Dave Horowitz is a bit of a sequel to the tragic original, "Humpty Dumpty,"rhyme, following the poor guy/egg as he falls, is horrifically injured, but then in a new twist put back together by a doctor. My wife and I found it when on a trip at a local bookstore and are glad we did as it is a great book for kids--such as our son Clarkson--and adults alike! After his injury Humpty doesn't try to climb any more walls, mountains, or anything vertical of any sort. Instead, he just sits around in his underwear, watching television, feeling glum. Even when the Dish (famous for running away with the Spoon) stops by to try and motivate Humpty, it is to no avail. Eventually Humpty does get motivated to climb again, so as to save the King's men who originally were of no use in putting him back together when they get stuck on a mountain. After that, Humpty finds himself reinvigorated and ready to climb all kinds of structures again--from now on always using the proper safety gear. Horotwitz uses a great mixture of rhyme, humor (who doesn't find an egg in underwear funny? ), and has an encouraging message as well, telling us it is okay to fail/fall down, and the key is to keep trying as opposed to getting discouraged when something goes wrong. Horotwitz's illustrations are delightful and full of fun little touches that make every page a pleasure to flip-through. 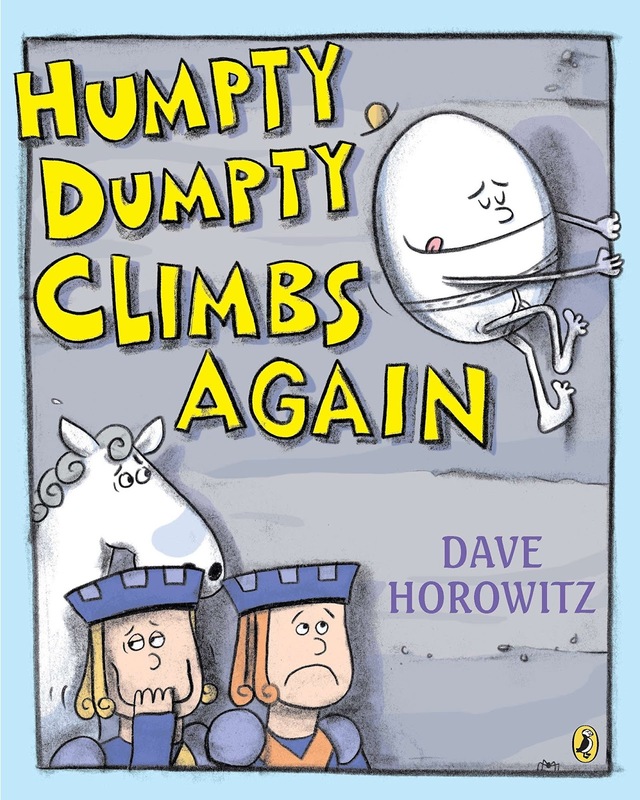 "Humpty Dumpty Climbs Again," is a stellar read and one I enthusiastically rate 5 out of 5 stars. I'd encourage anyone interested in this book to see if their local library carries it, purchasing it online or at a local store, and visiting Dave Horowitz's website to check out his other works too!